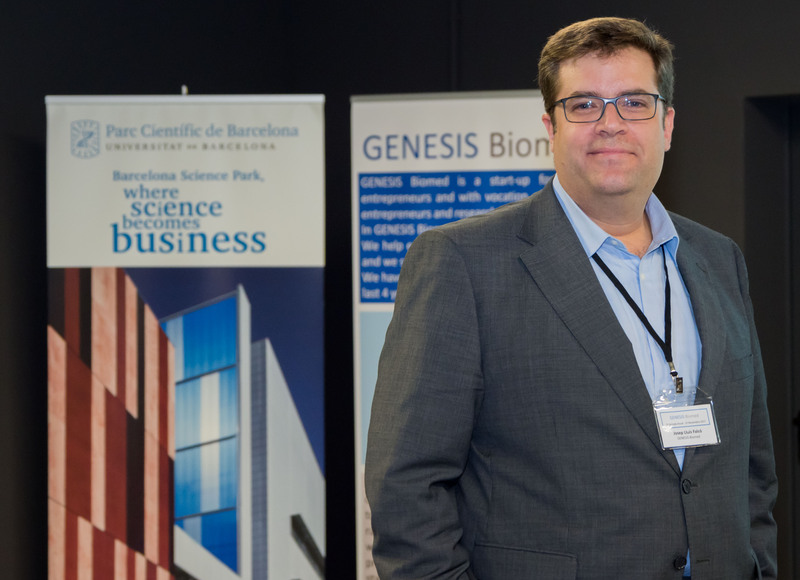 Barcelona, 11st January 2019 – The GENESIS Ventures fund, managed by GENESIS Biomed, has invested a total of €325,000 in five start-ups, spin-offs and projects in the biomedical field during its first year of existence. Quality Pharma SL: a start-up founded in the Karolinska Institutet which is developing a new Clinical Decision Support System to detect adverse drug-drug effects and make it easier to manage chronic complex polymedicated patients. Elem Biotech SL: a spin-off from the Barcelona Supercomputing Center-National Supercomputing Center (BSC-CNS), Barcelona Tech University (UPC) and the Spanish National Research Council (CSIC) which is developing a powerful programme to carry out virtual simulations of organs and tissues. NeuroHeal Project: a project from the Neurosciences Institute of the Autonomous University of Barcelona (UAB) for a new treatment to regenerate nerve tissue. Aptamer Project: a project from the Aptamer Group of the Ramón y Cajal Health Research Institute (IRYCIS) of a new aptamer to treat triple-negative breast cancer. ADmit Therapeutics SL: a spin-off of the Bellvitge Biomedical Research Institute (Idibell) which is developing an early diagnostic test for Alzheimer’s disease. During 2018, GENESIS Ventures aims to invest in 10 more projects or companies to complete its €1.2 million investment fund. The tickets vary between €50,000 to €100,000 per investment. GENESIS Ventures is a fund made up of family offices and proprietary capital which invests in research and entrepreneurial projects in the very early stages in the field of biomedicine (therapeutics, diagnostics, medical devices, digital health…). The goal is to help entrepreneurs to reach the value needed for their research so that they can later attract the first round of investment of corporate funds or venture capital (Series A). 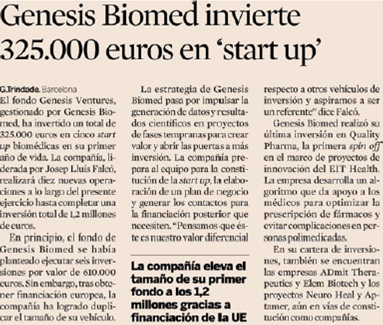 The fund is managed by GENESIS Biomed Consulting Firm founded by Josep Lluís Falcó and located in the Barcelona Science Park. Falcó has worked in the sector for more than 20 years and has dedicated the last 7 years to consulting activities, where he has managed to raise more than €40 million for different projects.